Email Shaykh (Mourad Al-Jazaa’iri)- The end to his delusions & lying has finally come! This post has the full details of the conclusion of the saga of the email shaykh. It makes clear the despicable lies that he attempted to spread, coupled with an example of his inquiring and attempting to entrap and “catch someone out” at any cost – even if it means asking a person “for the sake of Allah” to attest to a lie! All of his actions are for one simple goal – Place doubt on the Salafi Masjid and Masaajid, to taint their exposition of the innovations and misguidance of Yahyah al Haajoori – His Shaykh. By attempting this he seeks discredit anyone and in turn stop them from clarifying the haddadi manhaj of his shaykh; which in actuality, he himself mirrors. This document will make clear to the reader that this fanatical follower of al-Hajoori is in one of two states; and there isn’t a third place for him. Delusional; lives in a world of fantasy, conspiracy, plots and plans… an alternative reality to everyone else. An outright and shameless liar; (typo corrected as some text was cut off from the server) who will do whatever it takes to defend his shaykh (because he has been declared an innovator by the scholars), whether slandering others and spreading it in the month of Ramadhan, or making up an entire fictitious event and attempting to subliminally and forcefully convince others of its existence. People cling onto a thousand doubts and speculations regarding an affair, whilst deliberately refusing to acknowledge and submit to one truth. This is the case of the despicable saga of the email Shaykh. He has spent the last few days (of Ramadhaan) battling us (and maybe himself, with the number of times he has invoked the curse of Allah upon himself) with lies, slander and outlandish claims. All this in his burning desire to spread suspicion and rancour between the salafis, in Manchester, Birmingham, the UK, and wherever his emails can reach. Yet one of the claims which underpins his entire attack against the Salafi Masjid has now been laid bare to waste; shattering his delusional dreams of putting up any truthful defence of his shaykh (al-Hajoori), and attacking the salafis who follow the clear verdicts of the scholars. We at Al Markaz as Salafi knew without a doubt that this statement of his was born out of two things: [Ghulluww] Excessiveness and exaggeration in speech; and rage… rage that his lies were being made clear and rage that his public doubt-filled defence of Al-Hajoori al-haddadi and rejection of the verdicts of Shaykh Rabee’ and Shaykh Ubaid, were being made clear to the people against his wishes; rage at the fact that the reputation he so desperately wished to advertise as a defender and “pillar”[!] of Salafiyyah in Manchester and elsewhere was now slowly but surely deteriorating into the foul-smelling waste rubble of a demolished building rather than a “pillar”! So due to his persistent lying and transgression, we decided to respond and clarify that his statements were lies, all in the hope that he would recant, make tawbah openly (as he was sending these emails out to whoever he wished), and return to the sound positions of the scholars. So Alhamdulillaah, these witnesses bore witness… they attested to the truth. And so we would like to share with the readers their testimony. We have removed their names, because we understand that the general reader may not even know them. Rather the aim behind this is so that the reader should understand the great lengths this person goes to in lying and twisting, to harm the only Salafi Masjid in his vicinity; and by extension al-Hajoori (albeit on a micro scale). your email below dated 24th May 2009, appears to be factually correct from what i remember of the incident. You mentioned (ruqiah man) was staying (and I add he was actually also doing the Ruqiya) in Levenshulme, this was because the committee of the Masjid did not allow us to organise for him to stay and do the Ruqiya in the flat above the Masjid. This is the first email and was followed by a reply from the email shaykh to him asking direct questions. We will look at and examine this in detail shortly by the permission of Allaah. But to continue then the witness replied with the following. I will try to answer as complete as possible from what I remember. I don’t have any ulterior motives in this affair, as I am well aware how responsible I was for this mistake – May Allah forgive me – so all I can do know is answer the question and pray to Allah it is resolved quickly and completely. Alhumdullilah all of us have learnt now that the best Ruqiyaa is that which is done by ourselves and on/by our own family members. No he did not stay in the Masjid. Not even one night, as the committee had not allowed it, and hence the house in Levenshume had been organised. That is were he stayed all of the time as far as I am aware, and I have no knowledge to imply otherwise. Yes he came to the Masjid to pray, when I brought him there while he was up in north Manchester. If I remember correctly, we prayed and left without hardly any interaction. When the brothers as a committee decided he should not stay in the flat above the Masjid, then Yes, I believe (name removed) did make the necessary investigations to locate the house in Levenshume. I then organised the logistics of his stay. The remaining section of the email is not relevant, but we have pasted it in here anyway. Yes I believe (name removed) become aware of him via (name removed), who initially had taken members of his own family to him in London. But from what I remember, (name removed) did not know him, and was only aware of him when (name removed) went to him for advice. I have copied in the Masjid email for transparency, so if I have made a mistake, anyone is free to rectify or clarify my responses above. May Allah forgive us for our mistakes & help us all resolve this matter with the greatest of ease, and unite all of the Salafi’s upon the Haqq. Then first let us start by praising Allah the Most High – who is Ar-Raqeeb [The Ever Watchful Guardian] over everything. And may He reward this brother for his clear honesty, and preserve him upon the Sunnah. Indeed the reader can see clearly that the email shaykh’s claim (that the masjid brought a takfeeri to do rukia and charge £50) has been shattered by the most credible and prominent witness that he himself called upon! However even when his initial appeal for testimony was answered with “You mentioned (ruqiah man) was staying (and I add he was actually also doing the Ruqiya) in Levenshulme, this was because the committee of the Masjid did not allow us to organise for him to stay and do the Ruqiya in the flat above the Masjid…” the email shaykh was still not satisfied! What kind of sickness is this?! He has his answer (that the man made rukia in levenshulme and NOT in the Salafi Masjid) yet tries his utmost to squeeze out anything to indicate some wrong doing! And to compound it he says “I ask you for the sake of Allah”(!?). So we say – asks him for the sake of Allah for what?! To Lie? What kind of madness and evil is this?! Alhamdulil-laah the brother did reply to him, and in fact he further clarified everything, and with Allah lies all success! And in this one fell swoop his star defence witness became a star prosecution witness against him! By the blessing of Allah he spoke the truth. So now we will move onto the second witness, not to complicate the matter further and waste our time. I bear witness to the fact that this conversation took place in the email; that I did ring the man (the man who made ruqyah) and his son said he was residing in Levenshulme. And as everyone knows the masjid is in Cheetham Hill, not Levenshume. We hope that this clarifies that Cheetham Hill and Levenshulme are two separate places. And so we can see the lengths this defender of al-Hajoori goes to attack, slander and discredit the Salafi Masjid…all in the name of his fantasy land, mentally disturbed “truth!” Even his own witnesses whom he was appealing to in a last ditch attempt to prove a fantasy, have attested to the truth of the situation. This has shown the disgraceful and disgusting big lie that he was attempting to spread – has this man no shame? !, the purpose of which was to put shubuhaat in the hearts of the people, and credit himself thereby justifying his erroneous position towards (his Shaykh) al-Haajori. That lie has turned out to be exactly what is… a fallacy! There was no “rukia in the masjid, by a takfeeri for £50”. However we at al-Markaz as Salafi wish to bring a further witness in this whole affair… and that witness is non-other than the email shaykh himself?! Now although we do not believe he is a credible witness anyway (due to his excessive lying), then he had written this part of his “report” in 2009, so it shows the record he himself kept of the event. (etc)…. then (brother) phones the guy in Manchester, and he spoke to his son and his son said that he dad is with a guest and they were staying in Levenshulme. So in a nutshell, after his “investigations” he concluded that this takfeeri, doing ruqiyah, was residing in Levenshulme (south Manchester); whereas the masjid is in cheetham hill – i.e. north Manchester. 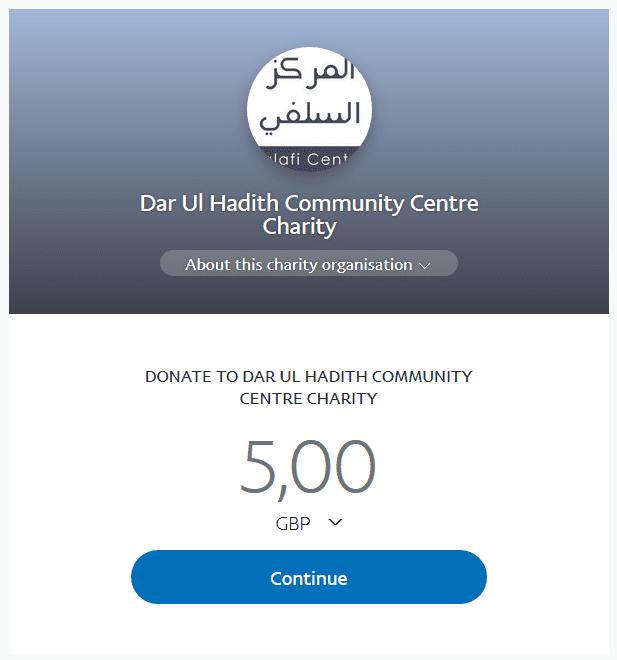 The email shaykh writes that this man was residing and making ruqiyah there… not as he incessantly now seems to repeat… “takfeeri do ruqiyah in the masjid and charge £50”. So can this man making ruqiyah, be in two places at once? 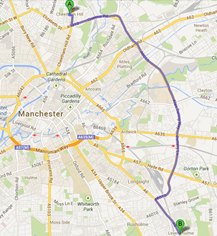 Or does the email shaykh not know the difference between Levenshulme and Cheetham Hill (click here for google maps)? Perhaps it is his quest of making a reality out of a fictitious event that has blinded him… There is no doubt then that this man is an evil and persistent liar. Let us put the investigator out of his misery… yes they were in Levenshulme and yes they were doing ruqiyah in Levenshulme– NOT in Al-Markaz as-Salafi – Cheetham Hill. O’ email shaykh… why do you continue lying that they were in the Salafi masjid in Cheetham Hill?! Can you not read your own writing? This blindness has been inspired by injustice and rage… so it is better that he fears Allaah and stops lying. Indeed (unjustified) anger is a disease of the heart born out of corruption of intention (paraphrased from Shaykh al Islam ibn Taymiyyah – “Diseases of The Heart and their Cures”). So without factual evidence and him having contradicted himself… can we now expect a tawbah (repentence) from him? An open retraction in full perhaps? Or is this his “Wallahi I never said it” Abu Usaamah-esque moment? An outright and shameless liar; who will do whatever it takes to defend his shaykh (because he has been declared an innovator by the scholars), whether slandering others and spreading it in the month of Ramadhan, or making up an entire fictitious event and attempting to subliminally and forcefully convince others of its existence. Either way such an individual is not to be trusted–he deliberately lies, plots, conspires and works with half-truth and fallacies. He has deliberately lied and slandered to suit his own goals! So if he does that with this affair then what about all the rest of his accusations!? We cannot take anything from this man when he has now proven himself an unjust irrational liar and a fanatical defender of an innovator and haddaadi (Yahyah al Hajoori). May Allaah guide him and protect us from the disgraceful falsehood that has plunged him into depths of unjustified rancour, anger, delusion, hatred and persistent lying… “The person tells the truth until he is recorded as truthful, and tells lies until he is recorded as a liar”. We are awaiting his open full tawbah… and to Allaah belongs all bestowal of the means to guidance and good deeds.